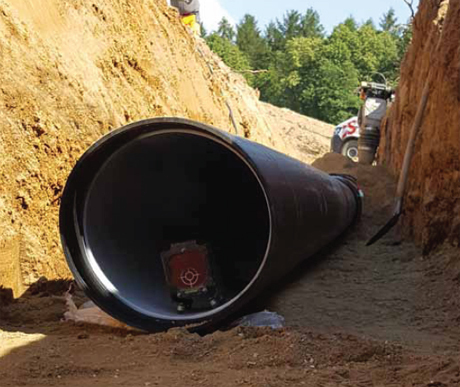 Along with the egeFuse® 2.0, gravity pipes made of polyethylene and the corresponding joining systems are supplied to the construction site simultaneously – in a single component, since they feature an integrated spigot end and weldable sleeve end. This way of proceeding is both time- and cost-saving. We improved the electrofusion connection which matches the wall thickness and now features a conical wall construction allowing for even faster connection. A mechanical axially force-locking plug-in connection ensures the secure fixation during the welding process required according to DVS 2207. In addition, a protection against any ingress of moisture in the welding area has been integrated. In order to realise a transition in the socket area which is as much on the same alignment as possible, the geometry of the spigot and sleeve ends have been redesigned accordingly. The level welded connection of the egeFuse® 2.0 sewer pipe renders additional earthworks at the pipe support superfluous. Welded polyethylene pipes have been installed and operated successfully as sewage pipe systems and sewers both in the municipal and industrial sectors for decades. Welded joints ensure a permanently tight and secure operation of sewage pipe systems. Any root ingress as well as ex- and infiltration will thus be ruled out. Thanks to the high ductility of polyethylene as pipe material, broken fragments and crack formation are now things of the past.